Every so often, The Legal Genealogist comes across someone who looks at the sheer volume of statutory law that may have some genealogical value and is aghast. Or at least there might be. And oh… you don’t want to miss it if there is. I just wanted to see who was included, specifically by name, starting at some random point in the book. I began at page 192, which happened to fall in the laws of October 1779, and read forward only 27 pages to the end of the October term of the legislature. That’s what’s waiting in the statutes. In fewer than 30 pages of one statute book. If a son were disowned in thlate 1790s or early 1800s, would that be in the Statute books? I that son had attempted manumission of family slaves, would that be in Statute books of the same time period? I am trying to track back and find the family of my 3x-great grandfather, a John Page. He arrived in Ohio (Ross County) about 1798 with George Emery, formerly of Loudoun/Berkeley counties in Virginia. John would have been about 24years old in 1798. I find lots of records for him from 1803 onward in Ohio. I find absolutely nothing in Virginia, so far. Disowning, no. That would likely be in the will and probate records of the parent. 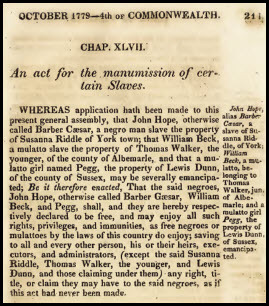 The manumission, possibly, since Virginia law might have required confirmation of the manumission by the legislature and the freedmen might have sought permission to stay in the state. Worth trying! Is the Legal Genealogist merely confining her remarks to the 13 volumes of Hening’s Statutes at Large that are on line? Is she neglecting the ten volumes of the Calendar of State Papers (1652-1859? ), the Journals of the House of Burgesses where naturalization are to be found, the Executive Journals of the Council of Virginia? Shepherd’s 3 volumes of Statutes at large (1792-1807). And, horrors, Joseph J. Casey’s Index to Personal Names in both Hening and Shepherd? No, not everything is on the internet. The Legal Genealogist is taking small bites at what is a very large body of available information! Can’t tackle it all at once, you know!